The Snaffle bridle has one bit and two sets of reins. 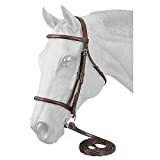 Snaffle bridles are used for hunter jumpers, and for many English riding disciplines. The Snaffle is a Wonderful Universal Bit!